Lennox is built on a legacy of innovative firsts, from the introduction of the riveted-steel furnace in 1895 to a solar-assisted home comfort system. Today, the legacy continues with exclusive technologies that deliver the ultimate in quiet, consistent, heating and cooling. As an industry leader, Lennox can do what no one else can – deliver the complete range of products needed to assure your total comfort. As a four-time winner of the ENERGY STAR Manufacturing Partner of the Year award-the first winner in the heating and cooling industry-Lennox offers a complete selection of high-efficiency systems that can save you hundreds of dollars every year on your utility bills. Lennox has a longstanding commitment to deliver innovative products that you can count on. That’s why you’ll find the Good Housekeeping Seal on most Lennox products. As one of the most widely recognized symbols of quality, the Good Housekeeping Seal assures you that the Lennox name is one you can trust. On top of exceptional quality you get when you purchase a Lennox heating or cooling system, you also have the comfort of knowing it’s backed by one of the best warranties in the business. For select high-efficiency systems, extended warranty protection is available when you register your product name. The Lennox name is known throughout the world for quality home comfort. So when you choose Lennox, you can rest assured knowing you’re getting the very finest in heating, cooling and indoor air quality. You can also trust Lennox dealer, Desert Air Conditioning, to design the right system for your home, install it properly and keep it running perfectly for many years to come. 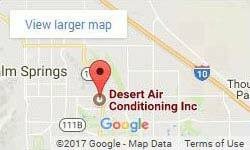 As a Lennox dealer, Desert Air Conditioning, Inc. offers a complete selection of high-efficiency systems that can save you hundreds of dollars every year on your utility bills. These systems help keep you comfortable year-round and contribute to a cleaner global environment.